Air Canada's Director of Sales, Eastern Canada, Steve Goodfellow. Journey: The poster for the BrandUSA film. Miles Davis and John Coltrane were among the famed musicians to grace this stage. American musician Aloe Blacc starred in the film and performed for a Canadian Music Week audience. Music is the universal language, and for many, it’s a major attraction of travel. Brand USA is counting on the power of American music – blues, jazz, gospel, folk, country, bluegrass, hip-hop, Latin and rock-and-roll among the main attractions – to attract more visitors. And it’s using a film sponsored by Air Canada and Expedia to help get the party started. 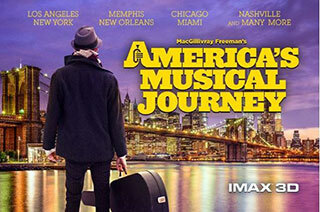 The 45-minute film, narrated by Morgan Freeman and starring musician Aloe Blacc, is titled America’s Musical Journey. 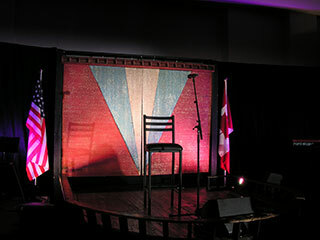 It was screened during Canadian Music Week at the Sheraton Centre in downtown Toronto, and the Brand USA contingent included tourism representatives from several cities and states where music plays a central cultural role – Austin, Chicago, Portland, Georgia, Myrtle Beach and North Carolina among them. It’s the second time Brand USA, Air Canada and Expedia have collaborated on a film project, with the 2016 National Parks Adventurenamed Best Film of the Year by the Giant Screen Cinema Association. The new film has already won an award at the Beijing International Film Festival. It is playing in various venues across Canada now, and will begin a year-long run in IMAX format at the Ontario Science Centre in Toronto on 23JUN. You can watch a trailer and see where it’s playing near you here. The U.S. is responsible for one-third of global music industry revenues, and there are musical hotbeds from Memphis to Muscle Shoals, New Orleans to New York City. Here are a few facts about some of those American music cities, courtesy of the visiting tourism reps.
Visit Austin’s Katie Cook represents the city that has trademarked “Live Music Capital of the World.” The city of less than one million boasts more than 250 live music venues – and 1,400 food trucks. Air Canada flies there non-stop from Toronto. Famed for its electric blues from legends like Muddy Waters and Buddy Guy, Chicago now boasts modern stars like Common and Chance the Rapper too. Choose Chicago’s Melanie Perez says the city is home to 225 venues and 35 summer festivals, including the Chicago Blues Festival, set for 8-10JUN. For blues fans, the lineup is a killer. Perhaps not as well known for its musical treasures as some of the other destinations, North Carolina is a bluegrass mecca and Raleigh hosts a weeklong festival each year. Heidi Walter of Visit North Carolina says the state was home to early musical luminaries like John Coltrane, Nina Simone, Earl Scruggs and Doc Watson, while today’s NC musicians include the Avett Brothers and Steep Canyon Rangers. With 100 km of beach, hundreds of golf courses and 1,800 restaurants, the Myrtle Beach area has lots to offer visitors. Julie Ellis of Visit Myrtle Beach says another highlight is seven different musical theatres featuring a wide variety of entertainment. Billed as “America’s Indie-Rock Theme Park,” Portland was getting grungy back in the early 60s when the Kingsmen released Louie Louie, known as the first ‘garage rock’ song. Karen Martwick of Travel Portland says creativity is “a defining hallmark” of the city, that now features musical transplants including Portugal The Man, The Shins, Modest Mouse and The Decemberists. 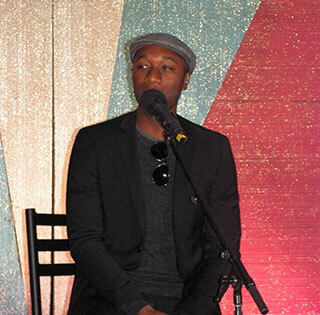 Following the movie screening, Aloe Blacc played an intimate live show for Brand USA invitees. He performed on a historic mobile stage from Detroit’s Bluebird Inn, where famed players including Miles Davis and John Coltrane blown their horns in decades past. 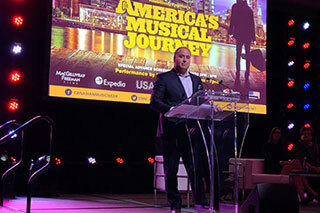 The international popularity of U.S. destinations including Austin, Nashville, Memphis and New Orleans proves the allure of America’s musical roots, and Brand USA and sponsors Air Canada and Expedia have made a wise choice in making it the centrepiece of a tourism acquisition strategy.